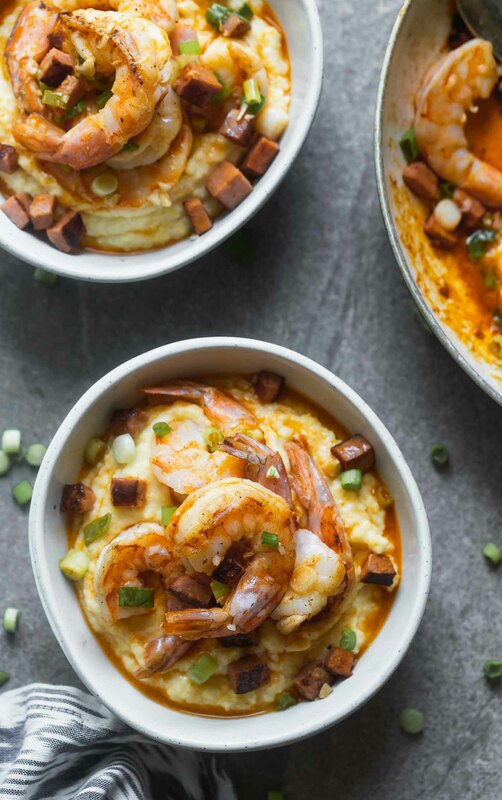 This Easy Shrimp and Grits Recipe is an authentic taste of a classic – creamy grits, spicy sauce, and sweet, succulent shrimp. Ahhh shrimp and grits. 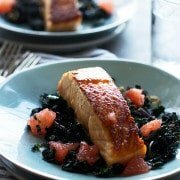 Easy to order at restaurants, hard to perfect at home. At least I thought it was. Because much to my surprise, it’s easy! So easy in fact, I find myself making it waaay more often than I should. Which happens with everything I shouldn’t eat. Shrimp and grits has always been one of those meals I order every single time I see it on a menu. Both because I truly love it and find it hard to resist, and also because I’m constantly trying to find the very “best” version out there. For a landlocked town, you’d be surprised how many restaurants are serving up pretty stellar versions of the dish, but my absolute favorite is from this restaurant that manages to make the creamiest, yet texture-heavy (quite the oxymoron, but so true) grits paired with the sweetest shrimp, all smothered in a zippy, spicy sauce. After ordering it dozens of times, I finally complied enough notes to try and replicate it at home. My inaugural version was DELICIOUS, but the grits needed perfecting, and now after a quick re-evaluation, I think I’ve got it nailed down. Although I can’t promise I won’t keep tinkering with it to make it even better over the next few years. Use quality grits. For me, this means Bob’s Red Mill corn grits . 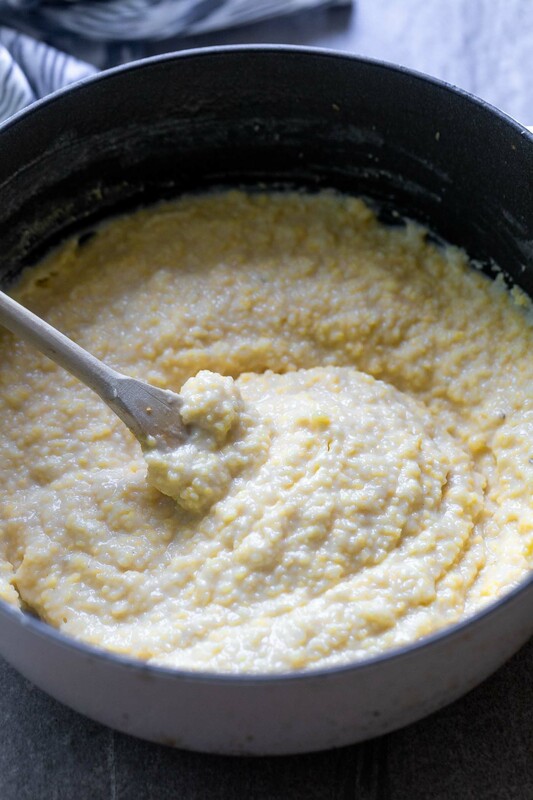 Instant grits, quick-cooking polenta and cornmeal will not suffice. Yes there’s a significant amount of butter and cream, no it won’t kill you. Trust. Use Frank’s hot sauce . This to me, has the PERFECT amount of spice to acid, and I love it. It’s also inexpensive, which I also love. Do not use cheap, teeny tiny shrimp. Splurge a little bit on 16-20 count large shrimp. Don’t substitute the andouille sausage for chicken sausage, or Italian sausage or…anything. The important thing to remember like any recipe, is the key to maximum flavor is all about layering ingredients. So for the grits I like to use part chicken stock, part water and part cream. 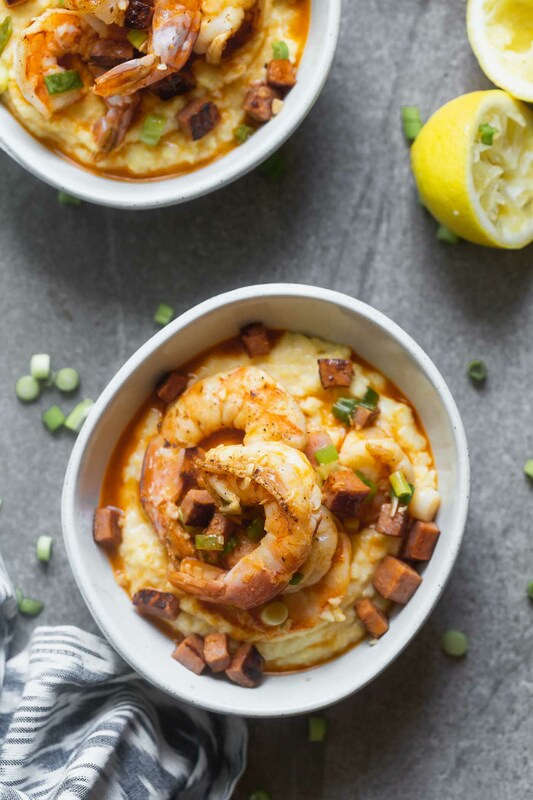 For me, it’s the perfect combination of liquids that flavor the grits, but also help create that super creamy texture that I (and everyone else) adores about good shrimp and grits. 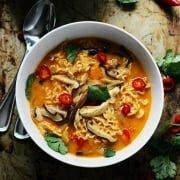 Aside from the chicken stock, another big flavor punch is from the addition of cheddar cheese, and not surprisingly so, extra-sharp cheddar is what I go for. 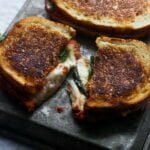 If you have it, a little bit of aged parmesan cheese would also be great, but it’s not mandatory. Like the grits, the sauce itself is pretty simple, but uses some key ingredients for maximum flavor – andouille sausage and garlic. 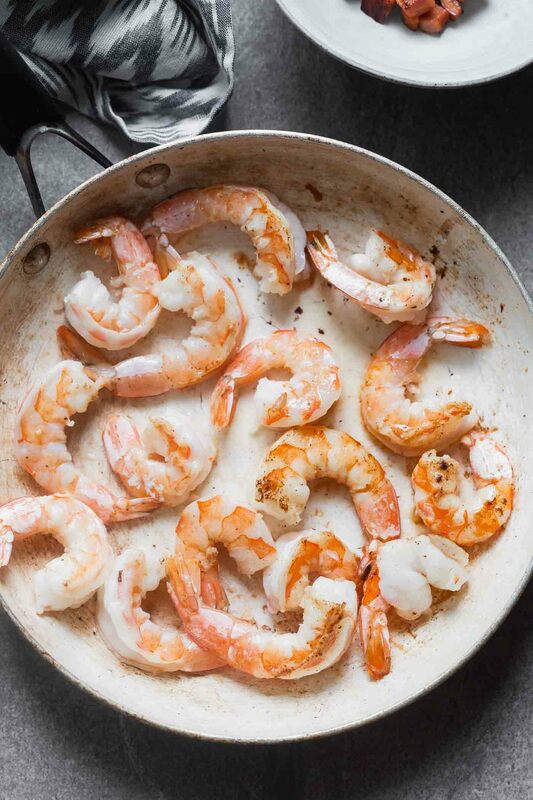 Obviously the sausage is something tangible you can find in the final product, but by sautéing the sausage in a little bit of olive oil before cooking the shrimp, it adds another layer of flavor you wouldn’t get by simply cooking the shrimp in olive oil alone. Once the shrimp and sausage are cooked, a little bit of garlic is added in along with plenty of Frank’s hot sauce, lemon juice for an acidic kick (a must), and butter, because butter belongs in shrimp in grits, obviously. 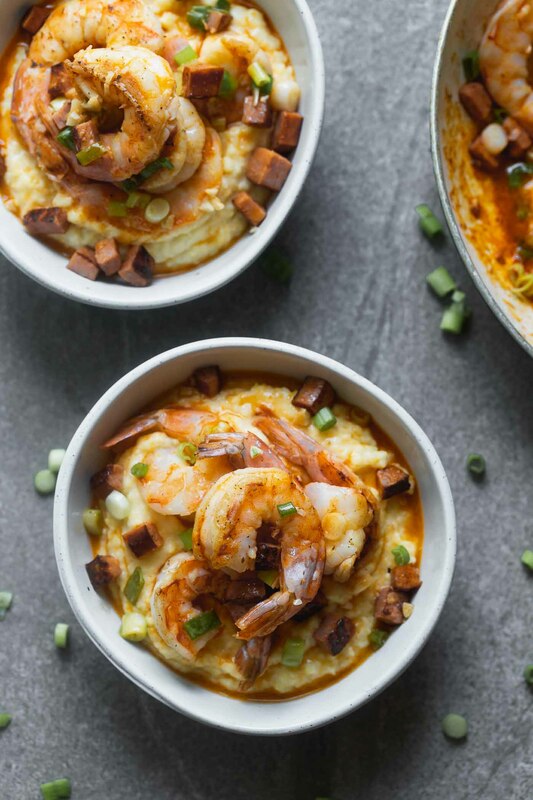 This Easy Shrimp and Grits Recipe is an authentic taste of a classic - creamy grits, spicy sauce, and sweet, succulent shrimp. Add water, chicken stock, cream and 1/2 teaspoon salt together in a large pot. Bring to a boil. Slowly add grits while whisking. Bring to a boil and reduce to a simmer. Simmer while stirring occasionally until creamy and cooked, about 40-45 minutes. Remove from heat and add 1 tablespoon butter and cheese. Stir until cheese and butter are melted. Season to taste with salt and pepper. When the grits are a few minutes away from being done. Generously season the shrimp with salt and pepper. Set aside for a minute. Heat a large non-stick skillet to a medium heat. Add 1 teaspoon olive oil. Once the oil is hot, add sausage. Sauté sausage until golden brown on all sides, about 2-3 minutes. Keep oil in pan and remove sausage with a slotted spoon. Keep the heat on medium and add 1 tablespoon butter to the pan. Add shrimp. Cook until shrimp are bright pink and cooked through, about 3-4 minutes. Remove shrimp, set aside. Add garlic, sauté 1-2 minutes or until softtned. Add chicken stock, lemon juice and hot sauce to pan. Bring to a boil and reduce to a simmer. Simmer for 2-3 minutes. 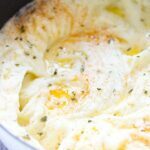 Once the sauce has reduced a bit, whisk remaining butter in one tablespoon at a time. Add green onion, reserved sausage, and shrimp. Toss and remove from heat. Season to taste with salt and pepper. Spoon grits into four bowls. Evenly divide the shrimp between the bowls and spoon sauce and sausage on top. Garnish with more green onion. 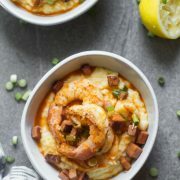 5 Responses to "Easy Shrimp and Grits Recipe"
This looks so good! Like our favorite restaurant!!! I got lost in step 4. I’m assuming “sauce” in a couple of places is actually supposed to be “saute”, but in step 4, after removing the shrimp and garlic, the next instruction says,”Sauce 1-2 minutes until softened.” All ingredients are accounted for in other places, so I’m not sure what it is I’m supposed to “sauce” (saute?) until softened. 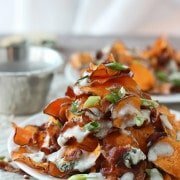 I really want to make this … help! Dean, I’m so sorry! Yes, autocorrect changed all of my “sautes” to “sauce” yikes! 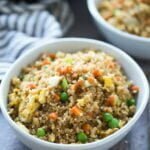 Recipe is updated! The saute 1-2 minutes pertained to the garlic! Made this tonight….and my “never try anything new” boyfriend loved it! Plus, first time making grits for this Cali girl for my southern man, and it was big hit! Thanks. Love hearing this! Thanks Mary!